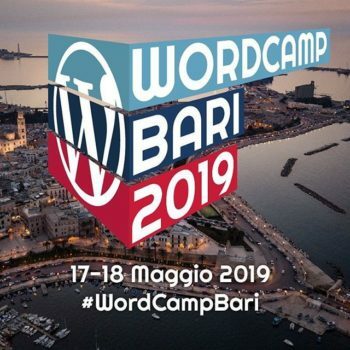 In a couple of months in Bari will take the second edition of ‘our’ WordCamp. The other day, as organizers, we begun spreading our Call for Speakers … and today I’m here to convince you to come and participate! Choose freely the one you like! Once the Call comes to its deadline, we gather and anonymize all the talks proposed – hey, did I tell you can submit more than one talk ? – and the organizers will have a list of titles and abstracts to vote. The talks with most preferences are officially invited to our Speakers’ roaster … Organizers will not know who will talk about ‘topic A’ until the voting are over, so to avoind any kind of favoritism. Of course we will also try the widest range of proposals, so we will not have 10 talks about plugin development since we’re gonna try to have a thing for anyone coming. So be creative and entertainign while proposing your talk. Sympathy is a good arrow to your bow. It’s with immense pleasure that we can finally announce to the world the forthcoming of the second edition of the WordCamp Bari. We’ve launched the new website, with a refreshed graphic made by Antonio Trifirò and our “social media & marketing” team has begun the promotion on the various channels. Very shortly we’ll launch also the Call for Speakers and the Call for Sponsors. Are you coming to say hello next May 17 and 18 ??? Contributing to the WordPress Project is a rewarding way to give back to the Community. This Slide Deck (PDF) was created so that any Meetup can easily present ways to participate in Make WordPress. Thanks to the Make WordPress team for sharing those slides! I’m gonna translate it in Italian ASAP. On the Make WordPress.org website yesterday was posted the article Proposal to Increase the Maximum Ticket Price for WordCamps ☞ . There it was asked to the Community – you and me, in fact – what’s the arguments in favor and disfavour of WordCamp tickets price raising. To me the most important thing is: I think that pricing should not be “imposed”. Each organizing team has to study what are the goals of the Camp, decide how many people to handle and then calculate the event’s ticket price as a ratio between costs of the basic services (ie venue) and visitors with an elementary division. Like I’ve written above free food or drinks or after-party is nice to have, but not mandatory. There are lots of cool things to have (swag, green room for speakers, free hotel room for them or free transport from air/stations to the venue) but not all of them are required – or will make me decide to come to your camp … it’s mostly the quality of the topics of the Camp and, in second place, the fame of the organizing community and ease to reach the city / nation of the event. My invite is to add YOUR comment to the topic, and help us to choose what’s best to do… Community and Open Source means participation, and this time you won’t be asked to code. WOW! Just … WOW! It’s been a huge event … and it makes me re-consider my opinions on the Italian desire to be the next host for the next “free spot” available in hosting this WordCamp Europe event. Our friend Pascal Casier has realized an entire website gathering events from all over the Italian WordPress community under a single umbrella, complementary ti all other channels made by the community. Among the many sections present in the website, there’s a page devoted to show off the ‘social’ events of the current month … the URL si Calendario Eventi. Here you can find all the details of the announced meetup, WordCamps and various encounters officially sponsored but the community. As you can see in the above screenshot when you visit the page you have the full month view, with everything listed in the particular date and, highlighted in yellow, the current day. In the second part of the screen, instead, you have a map of the official communities over Italy, followed by an alphabetically sorted list of the groups [clicking on a city’s name you are redirected to the relative Meetup group page]. Here you have also infos about the current number of the “meetup group subscribers” and, when present – as in the Bari’s case below – the formal link to the announced event. I think his initiative is excellent and commendable, and I invite those who have suggestions to contact him on the WordPress’ international or Italian Slack channels. Also, if you’re into WordPress and are coming to Italy maybe you can plan to say Hi to a local group, and possibly share some of your knowledge and experiences with us. You will be welcomed for sure! WordCamp Bari 2018 – get your ticket! Things are moving fast in Bari (Italy) as May 11 (our Contributor Day) and May 12 (the Camp / conference day) approach. During this week we’ll announce the final roaster of Speakers (we will have two tracks) coming from all over Europe, while the tickets have been put on sale a couple of days ago! Are you coming to enjoy two days of good people, great food and good time ?